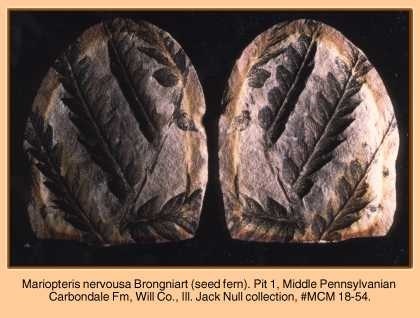 For over a century paleontologists, both professional and amateur, have been collecting the Pennsylvanian Age plant and animal fossils of the Mazon Creek Area of northern Illinois. The general limits of this area fall within a triangle formed by the towns of Morris, Wilmington and Essex. I have jokingly referred to this as the “fertile triangle.” The fossils occur in the Francis Creek Shale Member of the Carbondale Formation. The remarkable preservation of even the most delicate parts of both plants and animals is the reason that these fossils are so sought after. Also, the diversity of life is phenomenal. Over 500 plant species and over 400 animal species (vertebrate and invertebrate) have been identified thus far. Many more are awaiting identification. The number of soft-bodied animals, those that are rarely preserved: i.e. jellyfish, worms, larval fish, insects, etc., is extraordinary. It is no wonder that the Mazon Creek Area is one of the prime Lagerstattens of the world. 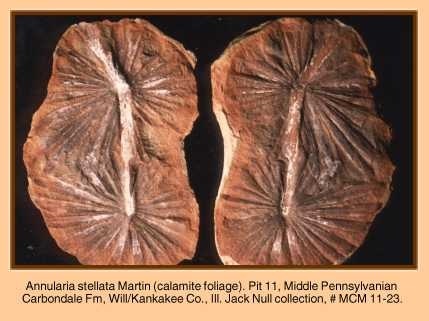 For those not familiar with the term Lagerstatten, it was coined in Germany, and simply put it, can be defined as a fossil Mother Lode. 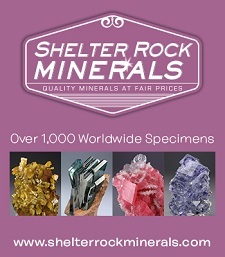 Each fossil comes neatly packaged in its own container –namely a nodule or concretion. It is the concretion that contributes to the remarkable preservation. These concretions are made up of ironstone, or more specifically siderite, Fe CO3 (iron carbonate). Ironstone concretions are rare, only occurring in certain Upper Carboniferous strata, and have been reported from England, France, Germany and the USA (Illinois, Indiana, Missouri and Oklahoma). In Pennsylvanian time, northern Illinois was made up of six distinct environments –upland, swamp forest, river channel, delta, drowned coast and shallow sea. The Mazon Creek Area is located on the large deltaic complex. This environment could be compared to todays bayou region of Louisiana. 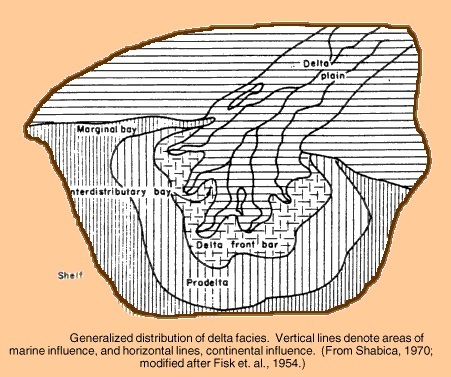 Although the nodules occur only in the sediments of the deltaic complex, we must have some knowledge of the surrounding environment in order to piece together the conditions that formed them. The entire process was a complicated combination of various chemical actions and reactions. The chemical action given off by a decaying organism will form these nodules, but only under the right conditions. Basically, these are: very rapid burial, high pH, and iron- rich sediments. A body lying on the sea floor is subject to destruction by wave action, scavenging, or simply rotting away. Earlier it was stated that rapid burial is one of the main conditions necessary for the preservation of organisms in siderite concretions. The discovery of upright tree trunks in the head wall of one of the strip mines confirms that rapid sedimentation took place. A tree trunk could not have remained unsupported for very long. Richardson (1969) states, “The accumulation and compaction of a few meters of shale could have occurred in a period of weeks or months rather than years or decades.” The organisms lying on the bottom are therefore sealed off from oxygen and scavengers by this rapid sedimentation. Normally, when an organism dies, it is immediately subject to aerobic (with oxygen) decomposition; however, when an organism is immediately buried, the free oxygen is quickly used up and anaerobic (without oxygen) decay takes place. 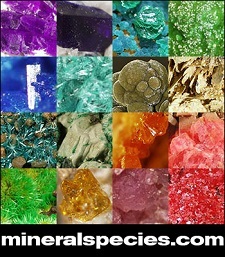 Each type of decay produces a different chemical action. After rapid burial the term of aerobic decay is very brief, thereby inhibiting the process of rotting away of the organism. Thus, the body has sufficient time to make a firm impression in the enclosing sediment before anaerobic decomposition destroys it. Let us keep in mind that there are swamps adjacent to or near the delta. The large amount of decaying vegetable matter is producing peat bogs. The chemical process that is decaying the plant material is also releasing iron from the soil. Moving pore water coming from these peat bogs supplies the iron that is needed. This water, however, is low in pH, much lower than is needed for the very restricted condition that forms siderite. The nearby marine water is also too low in pH. Earlier it was mentioned that an organism is subject to decomposition as soon as it is buried. During this process, the protein in the organism is converted to ammonia, which in turn raises the pH. This decomposition also liberates carbon dioxide (C02). Additional carbon dioxide for the carbonate was supplied by nearby degrading peat. As can be seen, a micro-environment has developed around the decaying organism. The only place that the pH and CO2 concentration was high enough to form the siderite was in the area immediately surrounding the body. As the various complicated chemical actions were going on, they formed a type of gel surrounding the body. Continued chemical action, along with ensuing load pressure, completed the hardening process. The siderite concretion is now complete –ready for an eager paleontologist to find and expose the beautifully preserved plant or animal within. This process of the formation of siderite concretions has been replicated in the laboratory. It was found that the time it takes for the gel to form is only about two weeks. Any organic material can precipitate this action –it need not be the plant or animal itself; slime, excrement, or body fluid (such as the mucus that some bivalves produce when moving through sediment) are rich enough in organics to produce this process. To expose the fossil encased in the concretion, the concretion must be split open. The organism within creates a plane of weakness: the concretion is placed on edge on a hard rock, e.g. granite, and struck with a hammer; it should split along that plane. With luck, a beautiful fossil should be rescued from its long resting place. In some instances, the plane of weakness is not very weak and the concretion will either shatter or split unevenly. Occasionally, a concretion is found that has been split open by Mother Nature by means of weathering. This process can be replicated by placing the concretions in a bucket of water which is put outside in the winter to freeze and thaw. This can also be accomplished by placing the specimens in a smaller container which is then put into your home freezer overnight –remove and let thaw. Repeat this process anywhere from four to twenty times.